Originally published in the Triangle Business Journal on March 9, 2018. There is still plenty of work left to be done at The Dillon, the new 18-story tower built by Kane Realty Corp. in downtown Raleigh. Crews are busy adding final touches to the facade and pouring the concrete of what will soon be fresh sidewalks on West Hargett Street. But despite that ongoing construction, parts of the development are now officially operating. The elevator has been padded in the residential building north of West Hargett Street, to protect it from tenants who have been moving their furniture into new apartments since March 1. 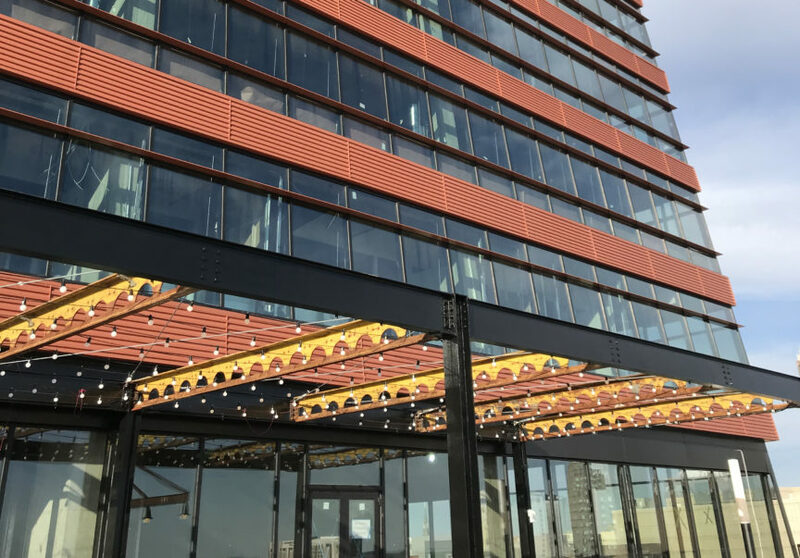 “Everyone’s been excited to finally get in here and experience the building,” Kane Realty Associate Director of Development Greg Kuruc says on a recent tour. Leasing agents are manning an office in a corner room on the first floor, where interested prospective tenants buzz in and out to get a glimpse of a model apartment. The units range in size from studio to one- and two-bedroom, with an average rent of about $2.50 per square foot, Kuruc says. That works out to about $1,500 per month for a 600-square-foot apartment. At this point, the building is 43 percent leased. The retail space on the first floor of the building will one day be entirely taken up by Weaver Street Market, although retail tenants likely won’t move in until late summer or early fall, Kuruc says. To the south, where the main tower of The Dillon thrusts into the sky, crews are still busy finishing office space for future tenants. Those include Stewart Engineering, FMI Corporation and co-working company Spaces. The entrance of the building sits at the corner of West and Martin streets, where a public square is boxed in by the old walls of the original Dillon Supply warehouse. Looming above the plaza is an elevator shaft that rises to the ninth floor, which will serve as the building’s public plaza. March – Tenants continue moving into residential building north of West Hargett Street. May – Expected opening of residential units in the building south of West Hargett Street. July 1 – Expected move-in date for co-working company Spaces. Late summer/early fall – Retail tenants move in. Weaver Street Market will take up all of the ground floor retail space under the residential building north of Hargett. Heirloom Brew Shop, O-Ku Sushi, Bishops barber shop, the Barcelona Wine Bar and a to-be-named restaurant will fill-out the retail space under the rest of the development. All told, about 40,000 square feet of the total 52,000 square feet of retail space at The Dillon has been leased.